Well, you know how I love to get out and make new friends and meet up with old ones. Last week I was at the famous little library in the old sugar plantation town of Waialua. I had just met with my printer, Mickey Wooley of Wooley Brothers, who has his silk screening shop across the dirt road from the library. 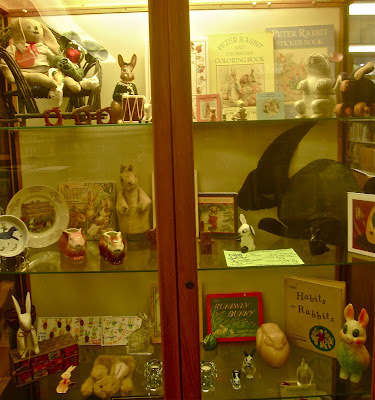 Tim Littlejohn, the head librarian, asked Mom if she had any collections because the display case was going to be empty in October. Well, you also know how Mom loves to thrift shop, so, yes, she did have a collection---of bunnies! Come by this award-winning library to get a closer look at her colony of rabbits.